Since 1996, members of the American Holistic Veterinary Medical Association have been using Myristin® for dogs, cats, horses, and other animals. 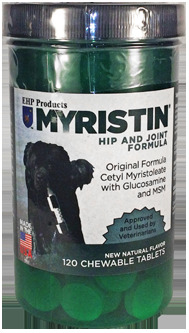 Myristin® Hip and Joint formula for Dogs, Cats, & Small Animals is a combination of the best joint health products, including Glucosamine Sulfate and MSM, along with our signature product, cetyl myristoleate (CMO), in a tasty chewable tablet formulated for small animals. Myristin® Hip and Joint Formula tablets are chewable and highly palatable, with all-natural flavoring of bacon.